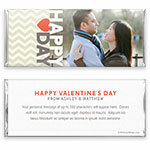 This contemporary photo candy wrapper is a great way to share your love this Valentine's day. Design: Chevron pattern accented with a bold heart and large photo. Personalization: Back title and personalized greeting. Recommended Photo Size: 1095 W x 769 H pixels.